Home/New York/September 2018 in Review. Can you guys even believe we’re into early October? That last week of September always flies by for me and then suddenly it’s a brand new month! As always, I like to recap the month here for you – I know not everyone stops by every day, so this is a nice way of sharing the best of the best – the posts you guys really loved, and of course the products you shopped the most! 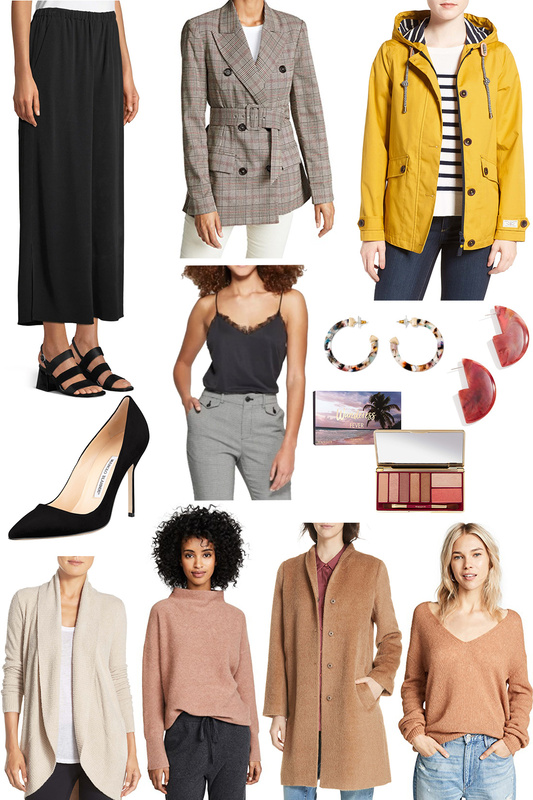 I laughed a little at the most shopped products (and accidentally included twelve items); as if I were to make a “Fall Capsule Wardrobe,” this would be it (maybe just add some denim!). And so here we are with the best of September! (And if you’re curious about Augusts best posts and products, you can read that here!) Lastly – please let me know what you guys want to see more of – I always love your feedback + post suggestions! THIS MONTH’S TOP 5 BLOG POSTS! one // September Reading List. My reading lists are always popular but this one was ultra popular, taking the #1 spot for the month! Glad you guys liked this it!!! (You can see October’s reading list here, for the record)! two // What’s in My Makeup Bag. I knew this one would do well as I love reading these types of posts. It’s just fun to see the products other people use every day. three // Best of Amazon. I am going to make this a regular thing! It takes a bit of digging but it’s so much fun discovering fun new labels, brands, and shopping finds over there. And Amazon Prime makes it extra great as everything comes in the mail so quickly. four // My favorite pieces for traveling. This is such a good outfit but I never really know which ones of my outfits you guys will like best. I’m glad this one was popular as this is a personal favorite! five // An end of Summer Detox for Clear Skin. If I learned one thing from this post it is that I’m not the only one whose skin is freaking out right about now. So glad this one resonated – it was fun to research and write. Here are the things you bought the most of, this month! one // this cozy Vince Sweater. I can’t even tell you how much I love this sweater and how many compliments I get on it! It’s so, so cozy… and so, so soft. two // Free People Gossamer Sweater. Free People always kills it this time of year and I LOVE this sweater. It’s so soft and cozy (just size down as with most Free People sweaters)! It’s the best. three // Eileen Fisher Coat. The best coat. And a splurge, but the best. I love it so much. I’ve only worn it in one outfit post so far but brace yourself, you’ll be seeing it a LOT once things cool down. I always say that you need to buy your winter coat while it’s too warm to wear it – the best ones always sell out! four // Eileen Fisher Wide Leg Pants. Oh gosh – Eileen Fisher is becoming my favorite and I’m glad you guys agree! These pants are amazing. They’re washable, they’re chic, they’re perfect for travel but also just for life. I LOVE THEM. five // Rachel Comey Earrings. I don’t actually own these earrings (yet) but have talked about wanting them quite a bit and am thinking that now you guys are peer pressuring ME to buy them! The reverse scenario!!! six // Barefoot Dreams Cardigan. I’m actually not really sure how this ranked as I didn’t talk about it this month, but it did – several of you bought it! I’m glad though as it is so cozy and wonderful… like wrapping yourself in a cloud. I keep mine at my desk to stay cozy while I’m working but it’s equally great for days in the park (or on the airplane)! seven // Manolo Blahnik Heels. The best classic pump you’ll ever own. I got these YEARS ago and continually link to them, but featured them in my fall shoe guide. Honestly guys if you make one big splurge this Fall I think it should probably be these heels! They’re also the most comfortable designer shoe I own. eight // ASTR Belted Blazer. I bought this during the Shopbop Sale and love it so much. The longer length is perfection and I love the belt! You can knot it in front or use the belt to cinch it from the back. nine // Joules Rain Coat. A really cute rain coat. If you are in the market, get this. The yellow is just perfection and makes me think of my childhood! ten // Wander Beauty Palette. VERY happy you guys took my word on this as it’s the greatest. Every color in this palette is highly wearable, it’s just perfect. We talked about it here and then here but it’s so good. Lately I’ve been wetting my brush before applying the eye shadows for a really pigmented look. eleven // Target Camisole. This is such a great basic and it’s only $14.99! WOW. twelve // Sugarfish by BaubleBar Earrings. I was so excited to find this $12.99 steal as resin earrings are such a big trend right now. Love these! The post September 2018 in Review. appeared first on The Stripe.